Super Bowl XLII was one of the most amazing moments in New York Giants history. From the final drive, to the catch,” to beating the then undefeated New England Patriots and giving them an 18-1 record; it was an incredible day for all Giants players and fans especially Eli Manning.That was only the beginning.With the rematch in Super Bowl XLVI, the New York Giants stormed into Indianapolis, facing the New England Patriots again in the Super Bowl, and just like the first meeting, they once again came out victorious. Eli Manning once again came out as the Super Bowl MVP, which he highlighted with the incredible pass to Mario Manningham in the final minutes of the game. 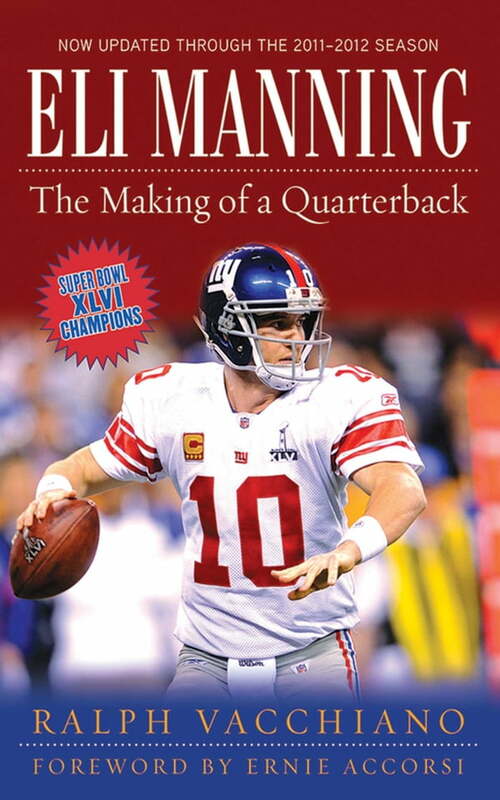 Eli Manning: The Making of a Quarterback is written by longtime Daily News writer, Ralph Vacchiano, and tells the story of the ELIte” quarterback, with amazing details of his first Super Bowl victory and updated through his most recent win in 2012. You will follow Eli from the bold draft-day trade that brought him to New York, through his dramatic ups and downs on and off the field, his first training camp, and his last minute heroics in Super Bowl XLII, to his courageous come-from-behind victory in Super Bowl XLVI.Complete with exclusive interviews with NFL stars, coaches, and executives and a foreword by former Giants General Manager Ernie Accorsi, Vacchiano uses his unfettered access to the World Champion Giants to present a true behind-the-scenes look at the quarterback and team that defied the odds twice and proved themselves to be the best of the best.